Thyroid function tests are utilized by essentially all medical practitioners, across every clinical setting, in patients from newborns to the elderly. They are the most frequently measured endocrine tests. The sensitive thyrotropin (TSH) assay reflects thyroid hormone feedback to the pituitary, and is diagnostic of both thyroid h- mone excess as well as deficiency. The log-linear relationship between serum TSH and thyroxine concentrations means that small changes in serum thyroxine are amplified by changes in serum TSH. The availability of the sensitive TSH assay in essentially all clinical laboratories has improved and simplified the assessment of thyroid function for the diagnosis of thyroid disease and to monitor treatment. Serum free thyroxine and thyrotropin concentrations, as well as other thyroid tests, can be measured utilizing an automated immunoassay platform that provides rapid and accurate results. This simplified approach to thyroid assessment, often requ- ing only a serum TSH measurement, and rapid availability of the thyroid function tests results, has expanded the scope of thyroid testing and clinicians ordering and interpretingth yroid tests. There remain, however, many challenges in selecting the appropriate thyroid function test to order, the correct interpretation of results, and applying these results to the diagnosis and management of thyroid diseases. It is especially important to be aware of limitations of thyroid function tests, as well as special clinical c- cumstances that can influence thyroid function measurements. The serum TSH concentration, for example, may not accurately reflect thyroid status in many si- ations including after prolonged hyperthyroidism when serum TSH remains s- pressed for months, in the presence of hypothalamic or pituitary disease, or due to a number of interfering medications. The serum free thyroxine, measured by the analog method, is not accurate with high or low serum binding proteins and d- ing pregnancy. Hospitalized patients often have thyroid function test abnormalities that are transient and return to normal after recovery from the acute illness. Iodine excessand deficiency candramatically influence thyroid function tests. Significant insights have been gained into the regulation of thyroid hormone synthesis and especially the role of thyroid hormone metabolism in supplying t- sues locally with an adequate supply of thyroid hormone. In a number of instances, these factors influence the selection and interpretation of thyroid function tests. Polymorphisms, common sequence variations, in genes of components that regulate thyroid function and thyroid hormone action may also contribute to variability in thyroid function tests in a population. v vi Preface This volume draws on an outstanding international panel of experts in thyroid function tests and thyroid function assessment. They represent clinicians, clinical researchers, and basic science researchers, all with a focus on some aspect of the assessment of thyroid function. The chapters all provide a clinical perspective, but are informed by themost recent scientific advancements. The first section of the book (Chaps. 1-3) presents the most recent advances in thyroid physiology, a review of genetic influences on thyroid function tests, and a discussion on the influence of iodine on thyroid function. In Chap. 1, Drs. Huang and de Castro Neves describe thyroid hormone metabolism, emphasizing the key role of thyroid hormone activation and inactivation in thyroid hormone action. Dr. Visser is a world leader in studies of thyroid metabolism and genetic influences on thyroid function. In Chap. 2, Dr. Visser and his colleagues, Drs. van der Deure, Medici, and Peeters, provide a clear view of this important and r- idly expanding field. The population variation in the TSH "set point" (relationship between serum TSH and thyroxine in an individual), for example, is thought to be genetically determined, and influences the evaluation of thyroid function and thyroid function targets for treatment of thyroid disease. Dr. Zimmerman, an int- nationally recognized expert in iodine, and his colleague, Dr. Andersson, provide in Chap. 3 an in-depth treatment of the most significant influence on thyroid function throughout the world-iodine intake. The influence of iodine deficiency and excess on individual thyroid function is discussed, as well as the population effects on t- roid diseases and especially fetal and neonatalde velopment. The basics of thyroid function measurements, approaches, limitations, and cl- ical applications are described for the major categories of thyroid function tests (Chaps. 4-7). The authors of these chapters are innovators in the field, strongly id- tified with the origination or significant refinement of the core tests utilized in t- roid assessment. In Chap. 4, Dr. Hershman describes the measurement of TSH, the clinical application and utilization. This remains the cornerstone of thyroid testing, but must be interpreted with an understanding of the dynamics of thyroid regulation. An active controversy in thyroid measurement involves the appropriate use of serum thyroxine measurements and especially the value of the analog free thyroxine me- urement, the most commonly used thyroxine assay. In Chap. 5, Dr. Stockigt p- vides a detailed assessment of thyroxine and triiodothyronine measurements and a clear message for their use and limitations. The most common etiology of thyroid disease is autoimmune, and the appropriate use of thyroid autoantibody measu- ments remains confusing to many clinicians. In Chap. 6, Dr. Weetman and his c- league, Dr. Ajjan, clearly describe the range of thyroid autoantibody tests and how they should be utilized clinically. Thyroglobulin measurement is the key tumor marker to follow thyroid cancer patients and Dr. Spencer and her colleague, Ivana Petrovic, describe the essential features of this measurement in Chap. 7. It is ess- tial that clinicians using thyroglobulin measurements to monitor thyroid cancer are aware of the performance of the assay being used and the factors that can interfere with the measurement. Application of thyroid function testing to the key clinical settings is discussed by expert clinicians and clinical researchers in Chaps.8-13. 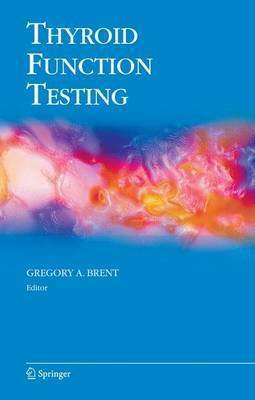 The appropriate selec- Preface vii tion of thyroid function tests in the diagnosis and monitoring of thyroid disease in the ambulatory setting is discussed by Drs. Farwell and Leung in Chap. 8. This is the most common setting for thyroid function test measurement and a rational approach is described. Specific issues of thyroid function in infants and children are discussed in Chap. 9 by Drs. LaFranchi and Balogh. Screening for thyroid disease among newborns has been a highly effective approach to prevent mental retar- tion. The assessment of thyroid function in newborns, especially premature infants, is challenging as are the interpretation of thyroid function tests in infancy through childhood. Illness has a significant impact on thyroid function tests and assessment in this group is described by Drs. LoPresti and Patil in Chap. 10. A logical approach to these patients is provided as are ways to identify those patients with thyroid disease that need to be treated. Assessment of thyroid function in pregnancy is ch- lenging and is being increasing recognized as a crucial time to normalize maternal thyroid status. Adverse outcome for mother and her child can result from thyroid hormone deficiency or excess. In Chap.11, Drs. Lazarus, Soldin, and Evans ca- fully describe the use and limitations of thyroid tests in pregnancy and provide an approach to testing and monitoring thyroid function. The incidence of autoimmune thyroid disease increases significantly with age and in Chap. 12 Dr. Samuels p- vides a clear approach to the assessment of thyroid status in the elderly and interp- tation of thyroid studies. The influence of drugs on thyroid function testing remains a major clinical issue with recognition of an ever increasing list of medications that influence thyroid function and thyroid testing. In Chap. 13, Drs. Pearce and An- thakrishnan comprehensively describe these medications with a special emphasis on their mechanism of action and on iodine-containing medications. I am most grateful to my colleagues for their enthusiasm and willingness to p- vide such outstanding contributions to this book. The editorial team at Springer is excellent and has been highly supportive and effective. My special thanks to E- tor Laura Walsh, Associate Editor Dianne Wuori, Editorial Assistant Stacy Lazar, Senior Production Editor Jenny Wolkowicki and Crest Premedia Solutions for final production. 34 Tables, black and white; 5 Illustrations, color; X, 392 p. 5 illus. in color.